Discerning customers choose Reid-Sohn. 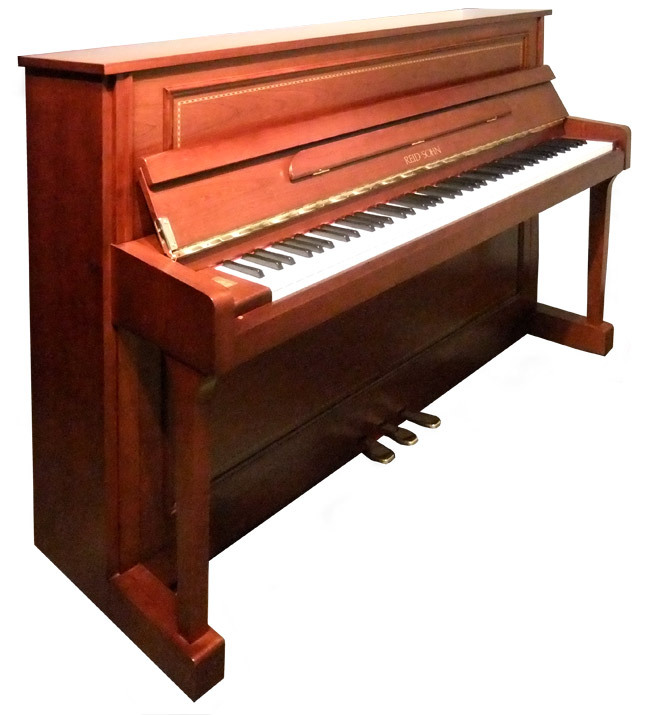 J. Reid Pianos sell pianos in very large quantities and we’ve been selling pianos since 1928 so when we put our name on a piano you can be confident that it will meet the highest standards. Our Reid-Sohn pianos are award winning pianos that exceed our customers’ expectations and are available in a wide range of models and finishes. The upright above is a Reid Sohn 112, American Walnut high polish finish. 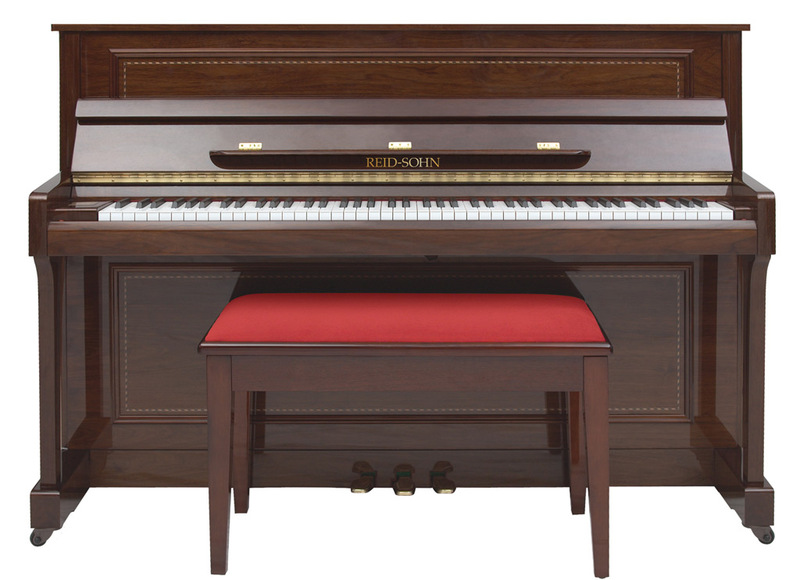 The Reid-Sohn Pianos have many benefits over their equivalents. 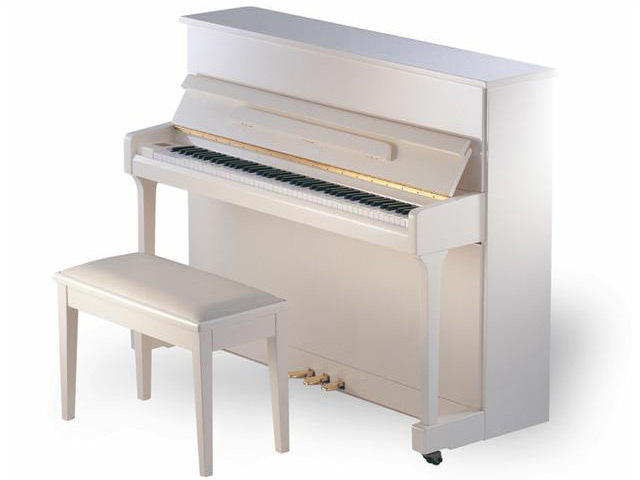 The build quality is the best of any piano manufactured in Indonesia. 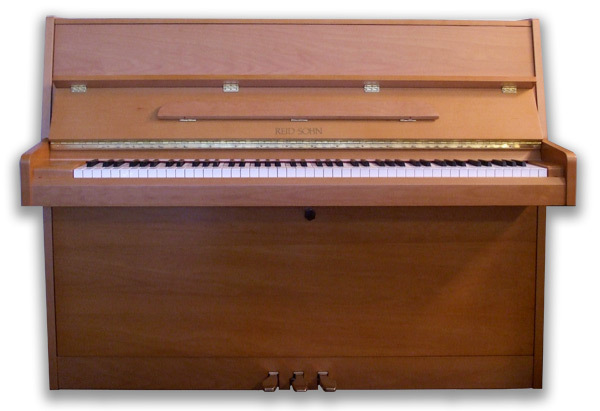 The upright above is a Reid Sohn 115, Ivory high polish finish. The upright below is a Reid Sohn 042, Natural Beech satin finish. 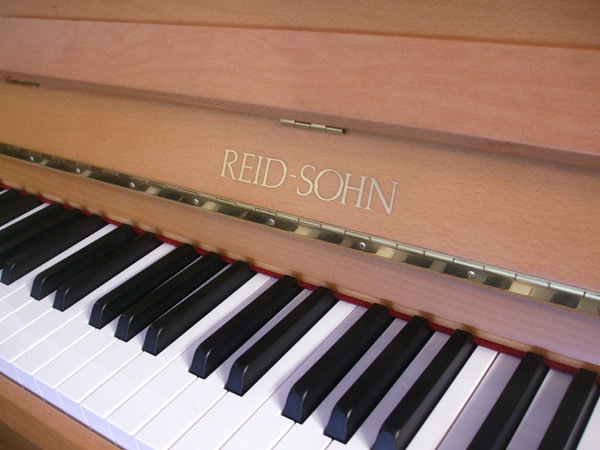 If you’re looking for a superb piano at an attractive price, we believe you will find a Reid-Sohn is the natural choice. The finest quality spruce and air-dried maple are combined with tempered, nickel-plated pins, German hammer felt and laminated German pin blocks. These create fine pianos long appreciated by discerning and exacting pianists. All Reid-Sohn pianos incorporate the latest developments in piano technology with the careful guidance of Klaus Fenner, co-developer of the of the imperial German scale. Reid-Sohn are proud to have won prestigious Music Industry awards for our magnificient traditional pianos. American Walnut high polish, American Walnut satin, Mahogony high polish, Cherry Mahagony satin, Ebony (black) high polish, Ivory high polish, White high polish, Natural Oak satin, Natural Cherry satin and Natural Beech satin. If required, any Reid-Sohn model can be supplied in any special finish. To find out more about the range of Reid Sohn pianos we have in stock please call 020 8800 6907 or complete our enquiry form below. Our Reid-Sohn pianos are award winning pianos that exceed our customers expectations and are available in a wide range of models and finishes. American Walnut high polish, American Walnut satin, Mahogony high polish, Cherry Mahagony satin, Ebony high polish, Ivory high polish, White high polish, Natural Oak satin, Natural Cherry satin and Natural Beech satin. If required, any Reid-Sohn model can be supplied in any special finish.